If St. John Paul II immediately comes to mind when speaking of the fall of the Soviet Union, His Beatitude Cardinal Lubomyr Husar must be recognized as one of the key figures who helped rebuild the spiritual and moral foundations of Ukraine after the dissolution of the USSR. Born in Ukraine in 1933, Husar left the land of his forefathers during World War II, lived his formative years and the first part of his priesthood in the West, and finally returned to Ukraine as a Catholic bishop determined to heal the wounds that decades of communism inflicted on his land. He eventually became the leader of the Ukrainian Greek Catholic Church and attained almost legendary status in his later years. Many Knights of Columbus were present at a massive procession in Lviv, Ukraine, June 3 and at the funeral in Kyiv, honoring the man who initiated the Order’s expansion to Ukraine and who predicted that the Knights would play a vital role in re-evangelizing the country. Born Feb. 26, 1933, in Lviv, young Lubomyr Husar fled with his family to Austria in 1944, ahead of the advancing Soviet army. The family came to the United States in 1949, and Lubomyr attended St. Basil’s Ukrainian Catholic Seminary in Stamford, Conn. He later earned degrees from The Catholic University of America in Washington, D.C., and Fordham University in New York City. He was ordained a priest March 30, 1958, and began teaching at St. Basil’s. One of his students was now-Msgr. John Terlecky, a pastor in the Ukrainian Catholic Eparchy of Stamford and a member of St. Augustine Council 41, also in Stamford. Major Archbishop Shevchuk likewise spoke about his predecessor as a man of peace and good humor in remarks to the media June 1. During the 1960s, Father Husar worked with youth at a Ukrainian summer resort and camp in upstate New York, where he was also a pastor. Christine Melnyk of New Haven remembers him as a “great listener” and as someone “you were not afraid to talk to about any topic.” On a visit to the United States — decades later and blinded by macular degeneration — Cardinal Husar immediately recognized Melnyk by her voice. Father Husar left the United States in 1969 to pursue a doctorate in theology in Rome. He then entered the community of Studite monks and taught at the Pontifical Urbaniana University. The then-head of the Ukrainian Greek Catholic Church, Cardinal Josyf Slipyj, was living in exile in Rome and feared that the episcopate of the Ukrainian Church might die out under Soviet oppression. To ensure apostolic succession, he secretly ordained Father Husar and two other priests as bishops in 1977, hoping for the day when the Church could once again practice openly in Ukraine. That day came in 1989, when the Ukrainian Greek Catholic Church — outlawed since 1946 — was legalized in a newly independent Ukraine. Bishop Husar, who had served as archimandrite (abbot) since 1978, moved his entire monastery to Ukraine in 1993. He served as a chaplain at Holy Spirit Seminary in Lviv, and in 1996 he received the first of several diocesan leadership appointments. In January 2001, Bishop Husar was elected major archbishop of the Ukrainian Greek Catholic Church, and just one month later, Pope John Paul II named him a cardinal. In June of same year, Cardinal Husar welcomed the pope to Ukraine. It was the pontiff ’s first and only visit to the former Soviet republic. Archbishop Mieczysław Mokrzycki of Lviv, who served as John Paul II’s private secretary for the last decade of the pontiff’s life, recalled Cardinal Husar’s fatherly role as an ecumenical leader. In the words of Pope Francis, Cardinal Husar gathered the Ukrainian Greek Catholic Church “from the catacombs” in a society deeply wounded by decades of communist oppression. The nation had roughly 300 Catholic priests at the time he returned — a mere tenth of the pre-Soviet number. As major archbishop of the largest of the Eastern Churches in communion with Rome, Cardinal Husar spoke out and wrote pastoral letters on a wide range of social, economic and political issues. He demanded that the government pay back wages, summoned politicians to stop election fraud, exhorted citizens to defend their dignity and voter rights, and invited Church leaders of different denominations to search for common ground. One of his major challenges was the perduring “psychological Soviet character” of Ukrainian society, said Msgr. Terlecky, who did missionary work in Ukraine in the early 1990s. In the midst of that, he said, Cardinal Husar came in and spoke about moral issues. He brought “a democratic breeze to a country stricken by about 40 years of Soviet propaganda,” wrote Italian journalist Andrea Gagliarducci following the cardinal’s death. The cardinal had, by the end of his life, won deep respect from broad sectors of society, regardless of religious affiliation or political persuasion. When addressing challenges in Ukraine, one place Cardinal Husar turned to for help was the international Catholic fraternity he had come to know in the United States. Cardinal Husar attended the Order’s 123rd Supreme Convention in Chicago in August 2005 and gave the homily during a concelebrated Mass. Communism, he added, left an atmosphere in which many people found it “very, very difficult” to live a Christian life outside of Sunday worship. According to Archbishop Soroka, who is a member of Bishop Stephen Soter Ortynsky Council 14088 in Philadelphia, Cardinal Husar had been talking about the idea of inviting the Knights to Ukraine even before attending the Supreme Convention. 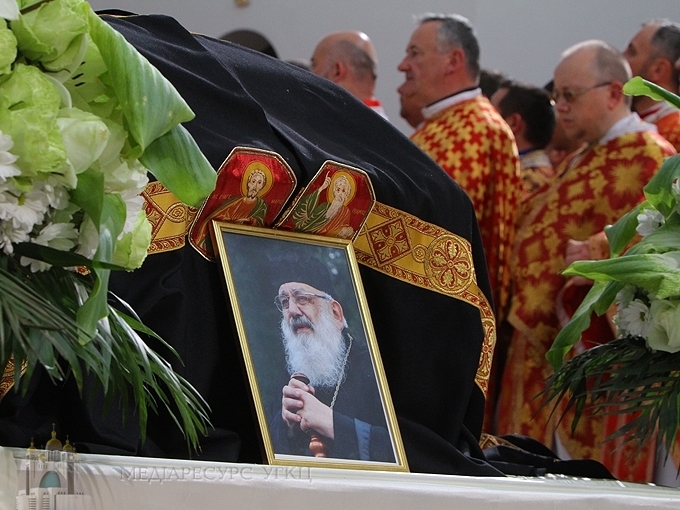 In 2011, with his eyesight worsening, Cardinal Husar retired. By then, however, the Knights of Columbus project had advanced. The Supreme Council, with assistance from Knights in Poland, had laid the groundwork for expanding to Ukraine. Nearly 100 men joined the Knights there in exemplification ceremonies in 2012 and 2013 — among them Major Archbishop Shevchuk and Archbishop Mokrzycki, who have greatly encouraged the development of the Order in Ukraine. Father Malchyn, who now serves as vice chancellor of the curia under Major Archbishop Shevchuk, became the first chaplain of the first council established in Ukraine, St. Volodymyr Council 15800 in Kyiv. Along with the John Paul II Council 15801 in Lviv, the new Knights served in very dramatic ways beginning in November 2013. Five blocks from where Council 15800 was meeting, tens of thousands of people gathered in Kyiv’s Maidan Nezalezhnosti(Independence Square). Their protests against corruption, human rights abuses and the government’s decision to reject closer ties with the European Union evolved into what would become known as the “Revolution of Dignity.” The rallies were marred by clashes with police, resulting in at least 100 deaths and many injuries. Knights tended the wounded, provided food and warm clothes, interceded for those who were arrested, and assisted families of people who died. They also set up a prayer tent in the Maidan to offer spiritual support. Major Archbishop Shevchuk recalled the powerful effect that Cardinal Husar’s words of peace had at the time. The revolution succeeded in throwing off what was generally considered a corrupt government swayed by Moscow. Many challenges remain for Ukraine and for the Church, including an ongoing insurgency in the eastern region. Father Malchyn revealed that in a meeting at the cardinal’s residence in November 2016, Cardinal Husar gave the Knights a new challenge. “The Knights of Columbus have to work in eastern Ukraine in order to raise the level of spirituality of our people there and to show them the real face of the Church — the Church as it should be — because unfortunately they didn’t have many good examples,” he told them. A few months earlier, the Knights of Columbus Board of Directors had designated Ukraine the Order’s newest territory, with nearly 600 members in 13 councils. Territorial Deputy Bogdan Kovaliv, who served as Council 15800’s first grand knight, stated that the words the cardinal expressed last fall made a particularly deep impression on the Knights who were present.